FARNBOROUGH, England -- After pulling out of a leadership role in the next rover mission to launch to the red planet, NASA plans to offer engineering expertise and technical advisors to Europe and Russia's ExoMars project, according to U.S. and European space officials. But the level of insight and advice to be exchanged will hinge on compliance with strict trade regulations, which restrict the export of U.S. technology and expertise outside of the country, according to Doug McCuistion, head of NASA's Mars program. The International Traffic in Arms Regulations, or ITAR, includes satellite and launch vehicle components on a list of restricted munitions. NASA signed up to provide launchers for a European-built orbiter and rover, and the Jet Propulsion Laboratory agreed to build a rocket-powered sky crane descent stage to deliver a 2,000-pound rover to the Martian surface. But the U.S. space agency retreated from the ExoMars mission when its budget proposal in February included no funding for the European partnership. ESA and the Russian space agency began negotiations on ExoMars in late 2011, and the parties signed a notice of intent in April. A formal framework for collaboration will be signed no sooner than November, when European government ministers will meet in Italy to establish ESA's budget for the next several years, including setting the budget for ExoMars. Russia will provide Proton rockets to launch a European methane-measuring orbiter and landing demonstrator in January 2016 and the ExoMars rover due for liftoff in April 2018. 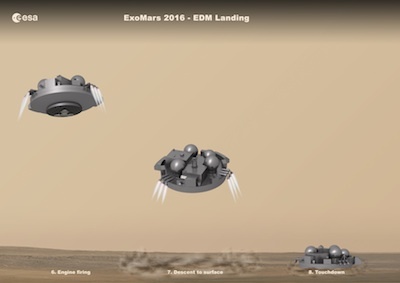 Russia's NPO Lavochkin space contractor will build the rover's entry, descent and landing system, including a heat shield, a core structure, propulsive thrusters, and a parachute, said Jorge Vago, ExoMars project scientist at ESA. "The idea is that parts of the landing stage on the 2018 mission will use European elements," Vago said, specifying Europe could provide computers, guidance systems and navigation algorithms. ESA has asked NASA for assistance and oversight on the entry, descent and landing phase of the 2016 and 2018 missions. According to Vago, NASA is also supplying an Electra UHF radio for the 2016 orbiter, which would relay commands and science data between Earth and the 2018 rover, along with other subsequent landers. 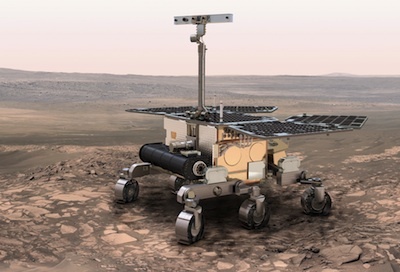 NASA is also still providing significant components of the ExoMars rover's sample analysis instrument, which will detect organic molecules in Martian soil. McCuistion said NASA's involvement will depend on constraints in ITAR, and he said negotiations are not yet complete. "We can't provide provide much hardware to them, but we can sit on review boards," McCuistion said. The European Space Agency has never attempted a landing on Mars before, and Russia has not achieved a successful soft landing on the red planet since 1971. "On both sides, there is the understanding that to make these things work, we have to sing to the same music," Vago said. "I think part of what Roscosmos is interested in is being able to think with us and using a similar type of development approach as what is being used in the U.S. and in Europe." Russia's latest Mars mission, which was intended to return samples from the moon Phobos, was stranded in low Earth orbit following liftoff in November 2011. The Mars 96 mission launched by Russia in 1996 fell back to Earth after a failed launch. "We need to make sure that the joint development is done in a matter in which both sides feel confident in the results," Vago said. "It's true they have been unlucky with Mars 96 and Phobos-Grunt. But I've done other missions, such as the Foton capsule, with the Russians, and those have always worked very well."